"Volcanoes are often triggered or accompanied by earthquakes, which are directly mentioned in Bible prophecy. Jesus Christ included earthquakes in His famous Olivet Prophecy. He prophesied of "famines, pestilences, and earthquakes in various places" (Matthew:24:7, emphasis added throughout). Prophetic passages in the Old Testament warn mankind of phenomena described very similarly to what we call volcanoes today. "You will be punished by the Lord of hosts with thunder and earthquake and great noise, with storm and tempest and the flame of devouring fire" (Isaiah:29:6). The apostle John describes major events leading to the second coming in the final book of the Bible. "I looked when He [Christ] opened the sixth seal, and behold, there was a great earthquake ; and the sun became black as sackcloth of hair, and the moon became like blood… And every mountain and island was moved out of its place" (Revelation:6:12, 14). Whether or not these prophecies specifically refer to volcanoes, they are all dire warnings of disasters brought on by humanity's sins and rejection of God." Is the number of volcanic eruptions worldwide increasing? 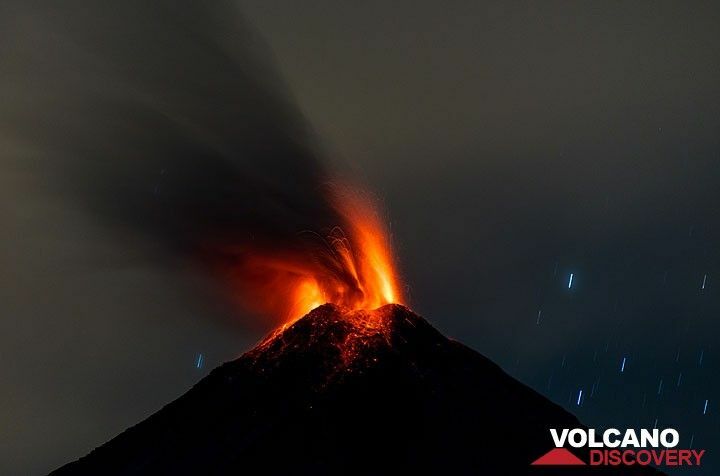 During the 20th century, there were a total of 3,542 volcanic eruptions globally. That works out to approximately 35 eruptions per year. That may sound like a lot, but according to Volcano Discovery there are 36 volcanoes erupting around the world right now. In other words, the number of volcanoes erupting as you read this article is greater than the 20th century’s yearly average. And all of this is part of a larger trend. In 2013, we witnessed the most volcanic eruptions worldwide that we had ever seen in a single year, and 2015 is already threatening to be another one for the record books. All over the planet, volcanoes that have long been dormant are beginning to wake up, and this is greatly puzzling many scientists. Fortunately, most of the eruptions in recent years have been relatively small. But scientists tell us that if we do see a VEI 7 or a VEI 8 eruption today, the amount of energy that would be released would be somewhere in the neighborhood of a million nuclear bombs going off all at once, and such an eruption would completely literally transform our civilization almost overnight. The last VEI 7 eruption that the world witnessed was in Indonesia in 1815. The deadly eruption of Mount Tambora in Indonesia sparked what was known as the ‘Year Without Summer’ in 1815 as crops failed and livestock died in much of the Northern Hemisphere – causing the worst famine for hundreds of years. However, academics have warned that the chances of a similar disaster happening in the next 85 years, which could see the Earth flung back into a “pre-civilisation state”, was estimated to be as high as one in 10. Due to dense population, an eruption which killed tens of thousands only two centuries ago would now be “cataclysmic” for today’s population, the authors warned. “Large volcanic eruptions have the potential to impact climate, anthropogenic infrastructure and resource supplies on a global scale,” the panel of geologists, economists and climate scientists from the European Science Foundation have written in a new paper. If you don’t think that such a thing could happen today, you should keep in mind that global food production is just barely keeping up with global food demand. In fact, in some years the world actually eats more food than it produces. Global food reserves are at perilously low levels, and so a “year without summer” would be absolutely cataclysmic. And right now, some of the biggest volcanoes in the world are starting to wake up. Small earthquake swarms occurred at shallow depths during the past days near the volcano. The quakes were located approx. 6-10 km south of Hekla volcano and at shallow depths around 5 km. The largest quakes were two magnitude 2.6 events at 4 km depth on Thursday (9 April). It is impossible to say whether the earthquakes are linked to volcanic activity and thus might be precursors of a new eruption, but Hekla is probably the most likely candidate volcano for the next eruption to occur on Iceland. One of the country’s most active, and the most frequently erupting volcano, Hekla has been believed to be “due” and have its magma chamber filled for several years now. Known for not giving much precursory signals (and only few earthquakes), an eruption would not be a surprise at all. Hekla volcano’s last eruption was 15 years ago. Fears of fresh eruption of Mount Zao, a volcano that sits on the border of the Yamagata and Miyagi prefectures, rattled Japan after the country’s meteorological agency recorded 12 volcanic earthquakes on Tuesday. The seismic activity prompted warnings of a volcanic eruption, with the agency asking the public to stay safe from falling rocks in a 1.2 km radius of the volcano, The Japan Times reported. More than 1,000 years ago Mount Paektu blew its top, sending tons of rock and magma spewing into the air and blanketing the much of the region in a thick layer of ash. If an eruption of that magnitude were to happen today, it would truly be a global event. In Iceland an estimated 20–25% of the population died in the famine and from fluorine poisoning after the fissure eruptions ceased. Around 80% of sheep, 50% of cattle, and 50% of horses died because of dental and skeletal fluorosis from the 8 million tons of hydrogen fluoride that were released. There is evidence that the Laki eruption also weakened African and Indian monsoon circulations, reducing precipitation over areas in Africa. The resulting famine that afflicted Egypt in 1784 caused nearly one sixth of the country’s population to die out. In Britain the summer of 1783 was known as the ‘sand summer’ because of the ash fallout and an estimated 25,000 people died due to breathing problems. Most recently, the 1991 explosion of Mount Pinatubo, a stratovolcano in the Philippines, cooled global temperatures for about 2–3 years. In 1883, the explosion of Krakatoa (Krakatau) created volcanic winter-like conditions. The four years following the explosion were unusually cold, and the winter of 1887-1888 included powerful blizzards. Record snowfalls were recorded worldwide. The 1815 eruption of Mount Tambora, a stratovolcano in Indonesia, occasioned mid-summer frosts in New York State and June snowfalls in New England and Newfoundland and Labrador in what came to be known as the “Year Without a Summer” of 1816. A paper written by Benjamin Franklin in 1783 blamed the unusually cool summer of 1783 on volcanic dust coming from Iceland, where the eruption of Laki volcano had released enormous amounts of sulfur dioxide, resulting in the death of much of the island’s livestock and a catastrophic famine which killed a quarter of the Icelandic population. Northern hemisphere temperatures dropped by about 1 °C in the year following the Laki eruption. In 1600, the Huaynaputina in Peru erupted. Tree ring studies show that 1601 was cold. Russia had its worst famine in 1601-1603. From 1600 to 1602, Switzerland, Latvia and Estonia had exceptionally cold winters. The wine harvest was late in 1601 in France, and in Peru and Germany, wine production collapsed. Peach trees bloomed late in China, and Lake Suwa in Japan froze early. These kinds of events have happened many times before, and scientists tell us that they will happen again. Here in the United States, people are closely watching the supervolcano that sits under Yellowstone national park. In recent years the ground in Yellowstone has been rising, and many observers are concerned that we are witnessing the lead up to a full-blown eruption. #1 A full-scale eruption of Yellowstone could be up to 1,000 time more powerful than the eruption of Mount St. Helens in 1980. #2 A full-scale eruption of Yellowstone would spew volcanic ash 25 miles up into the air. #3 The next eruption of Yellowstone seems to be getting closer with each passing year. Since 2004, some areas of Yellowstone National Park have risen by as much as 10 inches. #4 There are approximately 3,000 earthquakes in the Yellowstone area every single year. #5 In the event of a full-scale eruption of Yellowstone, virtually the entire northwest United States will be completely destroyed. #6 A massive eruption of Yellowstone would mean that just about everything within a 100 mile radius of Yellowstone would be immediately killed. #7 A full-scale eruption of Yellowstone could also potentially dump a layer of volcanic ash that is at least 10 feet deep up to 1,000 miles away. #8 A full-scale eruption of Yellowstone would cover virtually the entire midwest United States with volcanic ash. Food production in America would be almost totally wiped out. #9 The “volcanic winter” that a massive Yellowstone eruption would cause would radically cool the planet. Some scientists believe that global temperatures would decline by up to 20 degrees. #10 America would never be the same again after a massive Yellowstone eruption. Some scientists believe that a full eruption by Yellowstone would render two-thirds of the United States completely uninhabitable. #11 Scientists tell us that it is not a matter of “if” Yellowstone will erupt but rather “when” the next inevitable eruption will take place. Are you beginning to understand why the rise of volcanic activity all over the planet is such a big deal? Just a single VEI 7 or VEI 8 eruption could fundamentally alter the way that we all live our lives in a single moment. Despite all of our knowledge and all of our technology, the forces of nature are still vastly more powerful than we are, and scientists assure us that someday the United States will be directly confronted with that reality. BREAKING UPDATE: Findings in the Upcoming IG Report Are Said to be “Devastating” — Obama Interfered in Election More Than Vlad Putin! Reduce black crime. Guaranteed. Just don’t take reports. A new podcast with new examples from Colin Flaherty.